The urgency expressed by Pope Francis is grounded in harsh reality. The vast majority of the world’s population lives on a budget that falls well short of the poverty line in advanced economies. Specifically, 4.4 billion people – 71% of the global population of 6.2 billion – lived on $10 or less per day in 2011, according to a Pew Research Center analysis of the most recently available data. In our report, we divided people who live on $10 or less daily into two groups: the global poor, who live on $2 or less per day, and the global low-income population that lives on $2 to $10 per day. By this standard, the majority of the global population (3.4 billion, or 56%) is low income. A billion more people, 15% of the global population, are poor. In a historic achievement, economic growth pulled 669 million people out of poverty from 2001 to 2011. As a result, the share of the world’s population that lived on $2 or less per day was cut in half, from 29% to 15%. To a large extent, however, this merely served to boost the size of the next tier up – the low-income population – which increased by 694 million from 2001 to 2011. And many of the newly minted members of the low-income population are at the edge of the global poverty line, living on about $3 daily, perhaps only an economic shock from slipping back into poverty. A closer look at where in the world poor and low-income people live, and where high-income people live, reveals a wide gulf across regions. Our report categorized people as high-income if their daily budget exceeded $50. This is not a big leap for advanced economies – the median income in many such countries is greater. However, only 9% of the global high-income population lives in Africa and Asia-South Pacific, compared with 87% in North America and Europe. The divide between the global “haves” and “have-nots” also has not closed in the 21st century. In 2001, 86% of the world’s poor and low-income people lived in Africa and Asia-South Pacific, compared with 7% in North America and Europe. At the same time, only 6% of high-income people lived in Africa and Asia-South Pacific, compared with 91% in North America and Europe. The living standards within most African and Asian nations point to deep levels of impoverishment. In 18 of the 28 countries in Asia-South Pacific covered in the Pew Research study, nearly eight-in-ten people or more were either poor or low income in 2011. 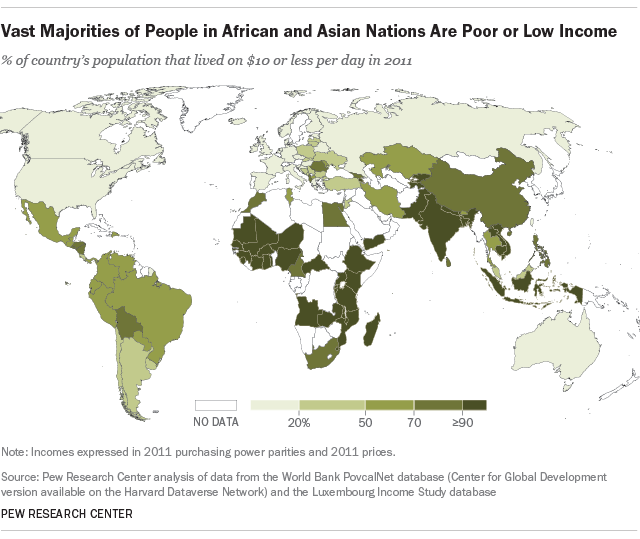 This group includes India, where 97% of the population is poor or low income, and China, where the share is 78%. Conditions within Africa point to even more deprivation. In 24 of 30 African countries included in the study, at least nine-in-ten people were poor or low income in 2011. That was the case in, for example, Nigeria, where 98% of the population was poor or low income in 2011, and Kenya, where it was true for 93% of the population. It is impossible to know if and when Pope Francis’ wish for an end to global poverty and inequality will be fulfilled. Other recent Pew Research surveys find optimism among people in Africa, India and China about their economic futures. But it is not unbridled enthusiasm. Most Africans recognize the challenges ahead, including the need for improvement in health care and education. In India, there’s concern about lack of employment opportunities and rising prices. And in China, inflation, corruption and inequality top the list of public concerns.